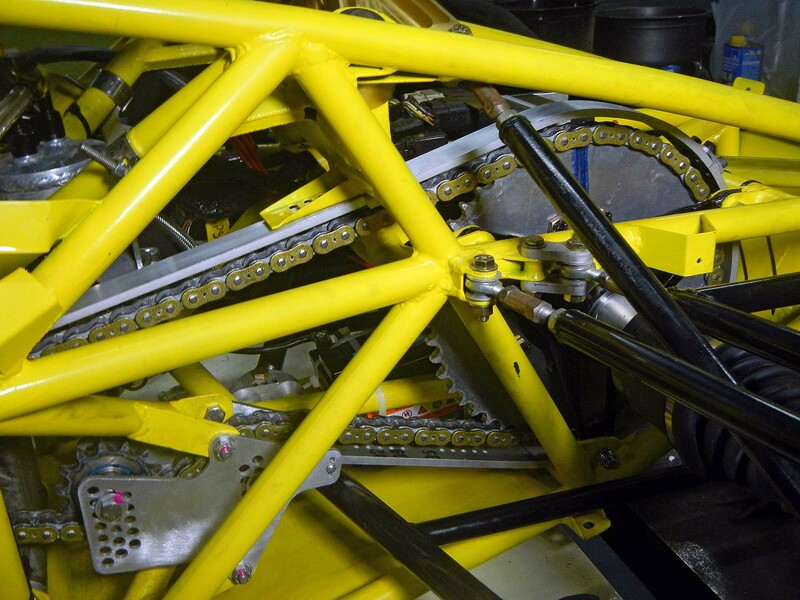 Formula 1000 rules require a chain guard equivalent to 1/4″ aluminum to contain the chain in case of a break. I had the blank laser cut, then bent it on my tubing bender. 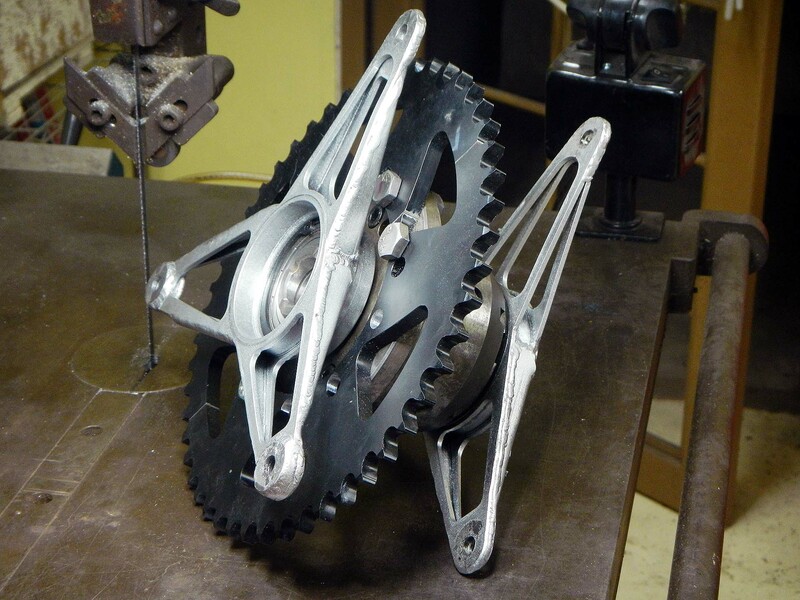 After bending, it was sliced in two parts for easier access to the chain and rear sprocket, drilled and tapped for an overlapping tab, cross-drilled for mounting holes, and installed. Off-label use for the tubing bender. Works great! Finished fuel tank. You might want to wear sunglasses. 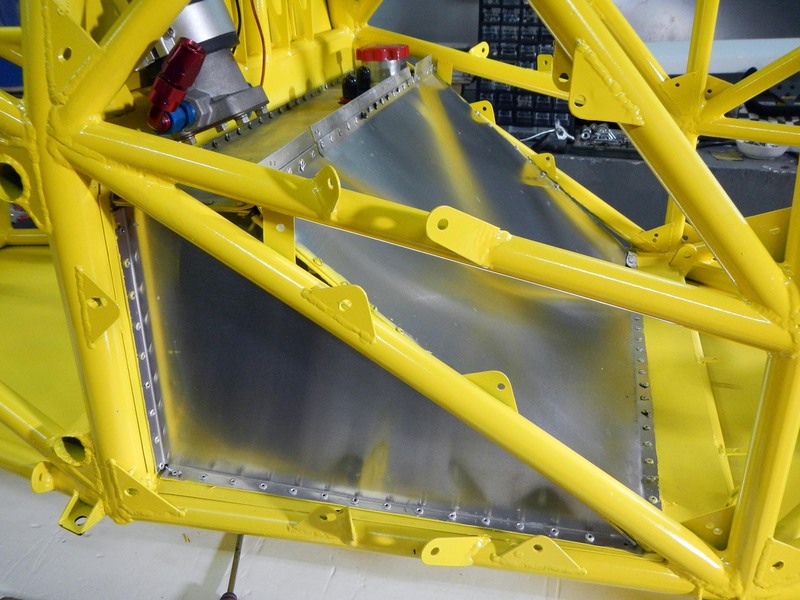 The fuel tank consists of an FIA FT3 certified fuel cell bladder, custom-made for this project by Aero Tec Laboratories, inside a custom made steel/aluminum container. The bottom and back of the container are made from a single laser-cut and bent sheet of steel, while the sides, front, and top are laser-cut and bent aluminum pieces. 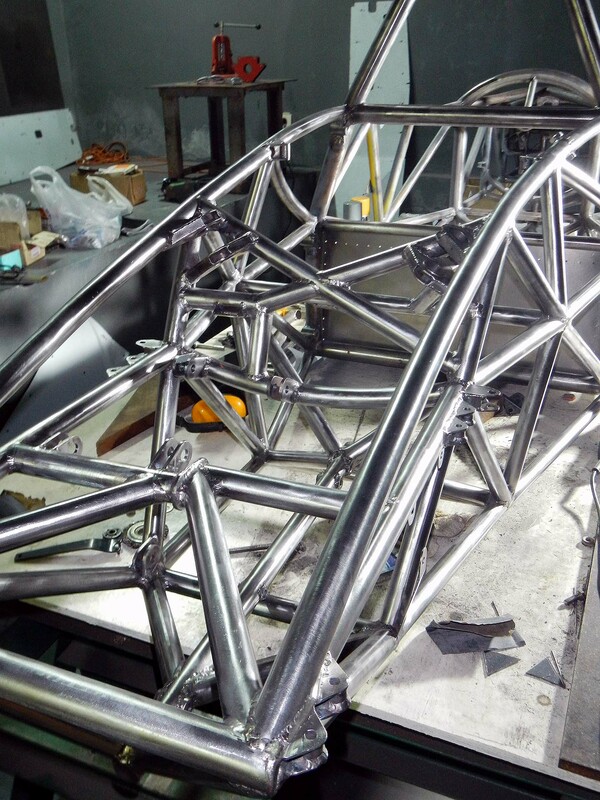 It’s carefully designed so the interior is completely smooth with all rivets and fasteners away from the fuel cell. All the rivet holes were laser cut also, meaning there’s only one way to fit it together– the correct way. This did make it very hard to install, however, as tolerances are zero to negative. Inspecting or replacing the fuel cell bladder should be possible by drilling out all the rivets on the diagonal front panel and removing it. Not something I want to do very often. 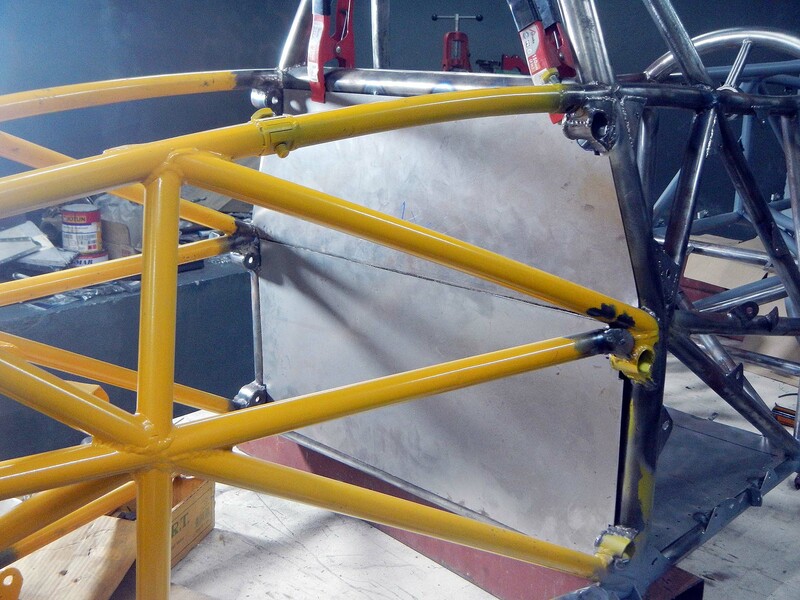 The nose mounts are so strong because the car will be lifted by a nose jack under the wing in the pits. 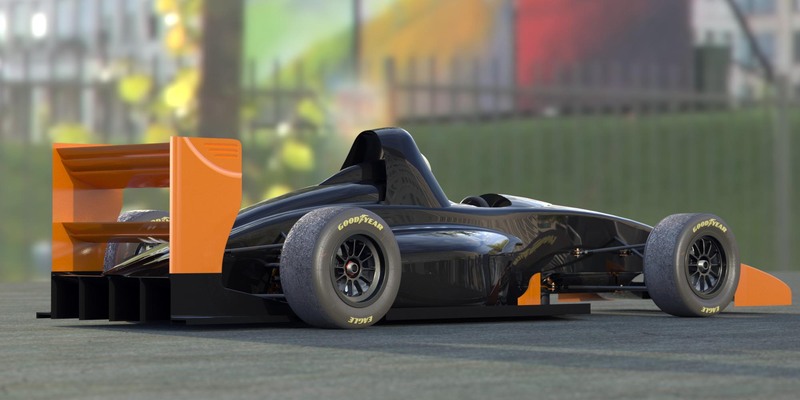 SCCA Formula 1000 rules require side-impact protection consisting of either kevlar laminated to the inside of the body, or 0.060″ aluminum or 18-gauge steel bolted to the frame. 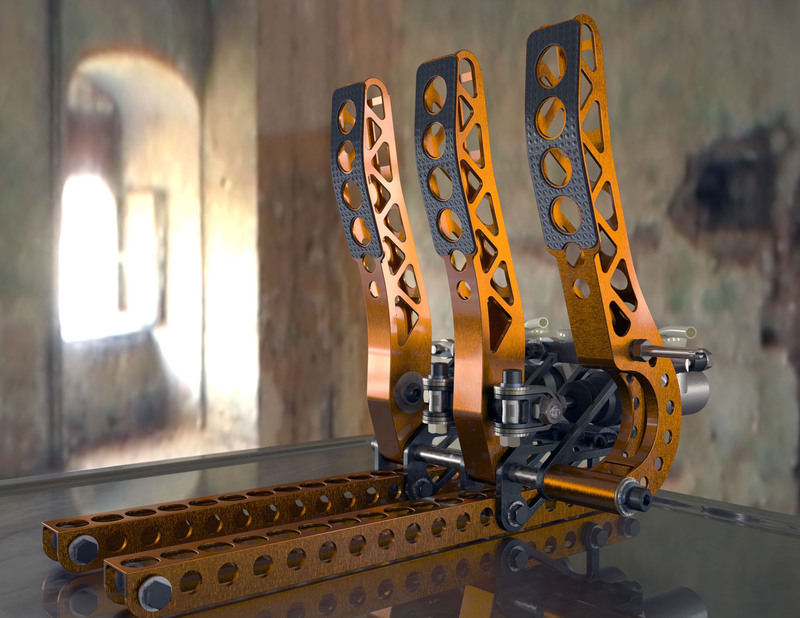 To keep the side impact panels from being used as a stressed member, attachment points to the frame must be more than 6″ apart. 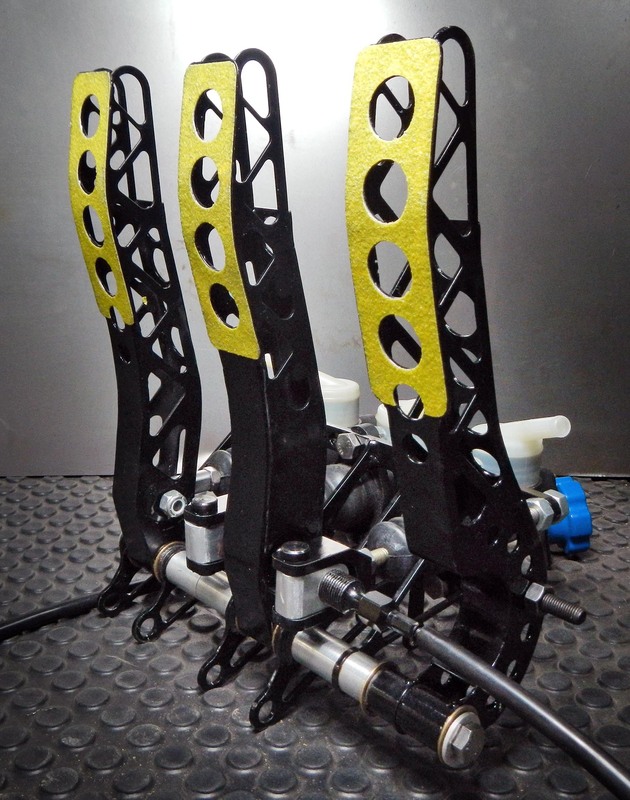 Mine are laser cut from 1.6 mm aluminum. The mounting holes were also cut by the laser to be sure of the 6″ rule, but this was a mistake as it made the mounting tabs much harder to fabricate. It would have been much easier to weld the tabs in place with holes already drilled, then drill through the tabs to the aluminum panels for exactly aligned holes. As you can see from one of the photos below, the panels fit perfectly. 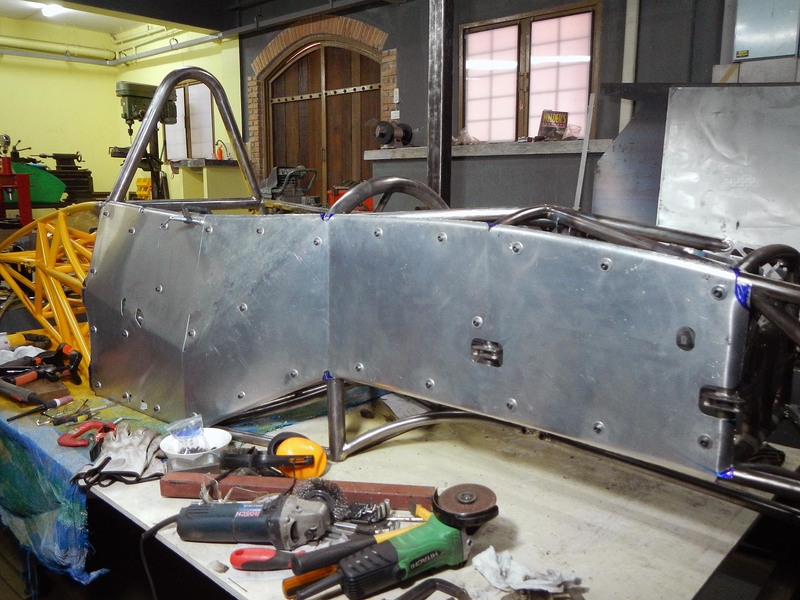 This project was a lot of cutting and welding with little apparent progress. Right panel. Note how panel was rolled over frame tubes. Later I plan on fabricating some sort of container or plugs to keep the oil in the diff. Drilling lower right mounting hole. Washers align the drill bit.